Fall, lovely fall, one of my favorite season, because it's not too hot and it's not too cold. I love the colors of fall, and there's no place like Colorado to celebrate it. 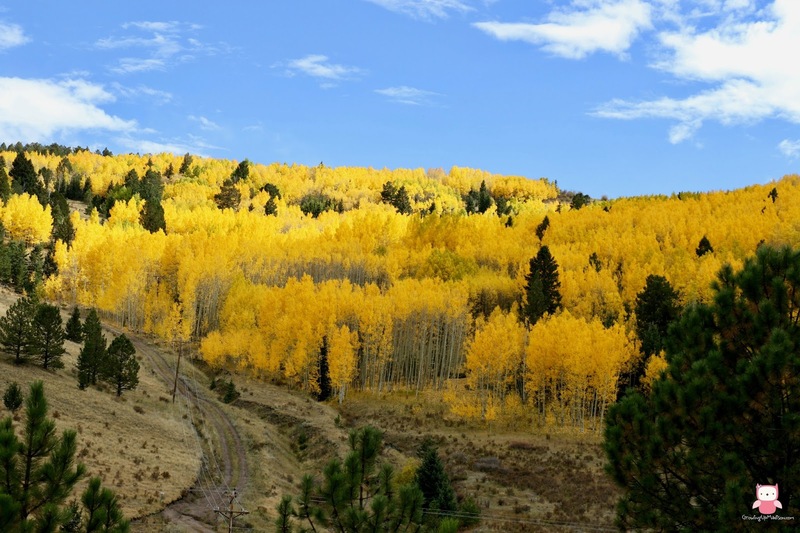 We recently decided to take a trip up to the mountains to look at the beautiful Colorado Fall Colors. It's when the trees change colors and you can see a sea of yellow, oranges and reds, or maybe just a sea of yellow as shown below. People travel from far and wide just to witness our colors and I don't blame them, because it's beautiful! You may notice that when fall comes around, we tend to eat more comfort foods, and one of those comfort foods that I just love and my entire family also loves is Quaker Oats. 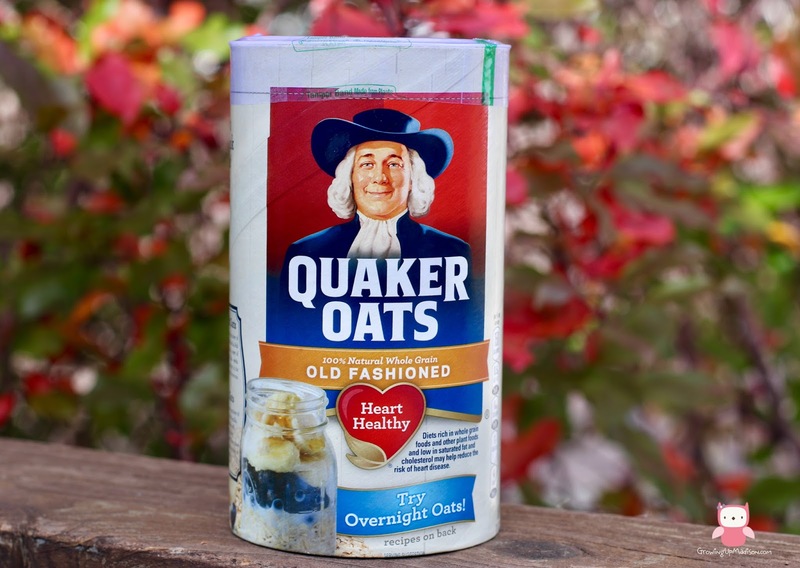 I grew up eating Quaker Oats and I remember my mother making oatmeal in the mornings for breakfast before I headed off to school. In the Caribbean we would call it "porridge", and it was usually our go to breakfast meal. It was filling and you know that you were getting a great meal. Now that I'm older and have my own family, I always keep Quaker Oats on hand, whether they be the original or instant, they're a must have in my own pantry. I've also been trying to eat a lot healthier as well. On my recent checkup with my doctor, I found out that my cholesterol was elevated and that I may also be diabetic. I have a follow-up visit in my very near future, but I know that I will have much better news. For one, I was traveling quite a lot this year. I've visited 2 countries and three states in 6 months and it took it's toll. I gained over 30lbs and I ate very unhealthy. Now I'm back on track, and Quaker Oats is there to help me with my dietary needs. Did you know that Oats are considered a super grain and has been part of daily morning rituals for more than a hundred years? I know it has to be true, because my mom died at the age of 72 and I'm 40, so I've been eating it for at least 36 of that, because I would get it for breakfast before school and I started at the age of 4. Oats are very versatile and there are so many endless possibilities, and so many different ways that you can incorporate it into your day. My kids just LOVE overnight oats and you can make that any way you feel. My favorite is strawberry and bananas overnight oats. However, with me now working out and trying to live a much healthier lifestyle, I decided to make my very own Homemade Pumpkin Spice Granola. With this being "Oatober", what's better than incorporating a little bit of pumpkin that we've all come to associate fall with. Add the dry ingredients to a large bowl and stir to combine. Add the wet ingredients to a separate bowl and whisk until smooth. Pour the wet ingredients over the dry and stir until evenly coated. Pour the mixture onto your prepared baking sheet and spread it out evenly. Place the pan in the oven on the middle rack. Bake for 15 minutes, rotate the pan, and bake for an additional 10 to 15 minutes or until lightly browned around the edges. Remove the pan from the oven and let it sit on the counter for at least 30 minutes to cool. The granola will crisp up as it sits. When the granola has cooled off, break it up into pieces. Homemade granola is incredibly easy to make! This version has all the flavors of fall and is loaded with protein, fiber, and nutrients. Grab a handful as a snack, or sprinkle it over ice cream, yogurt, or even pancakes for extra crunch! You can change up the ingredients, however you like. Some yummy additions would be dried fruit (other than mango), shaved coconut, or even mini chocolate chips. You can also change up the nuts to whatever you like or omit them altogether if you have an allergy. If you don't have pumpkin pie spice, you can use 1/2 teaspoon cinnamon, 1/4 teaspoon ginger, 1/8 teaspoon cloves, and 1/8 teaspoon nutmeg. And if all you have is cinnamon, that's fine too! I love making my own pumpkin pie spice! I think the word "porridge" is so appealing - due to all the nursery rhymes. I've been eating Quaker Oats for as long as I can remember too. When I was pregnant, it became a thing to make it over the stove and eat it with the previous spring's maple syrup. Then I'd add a fried egg on the side. BLISS. Yummy and healthy. I love anything flavored with pumpkin spice. I'm bookmarking this recipe for later. Well it's fall and pumpkin spice seems to be a hit every fall. I have been eating Quaker Oats for as long as I can remember. I know my parents use to make it for us along with Grits and even now I have them in my own kitchen. The kids love the instant ones with Maple and Brown Sugar but I love the original. Grits is also a staple in my house but that's because of my husband. He's obsessed with it and so it's always in stock in the pantry. My kids also love the Maple and Brown Sugar instant oats. Madison is in love with the Dinosaur Eggs. That sounds delicious. Now fall has officially become pumpkin everything! Can't wait to try this. Yum! I love granola, and pumpkin seeds are so tasty. This would be absolutely perfect with Greek yogurt in the morning. Now that's a great idea. I can totally see that. Homemade granola is so much better than store bought. You can control the amount of spice and sugar. I'd top this on my Greek yogurt. Homemade anything is always better. I personally prefer to make my own things because I know exactly what is in it. I love pumpkin spice and pumpkin spice granola sounds even better. This is perfect for autumn! Yes it is and something you can try on your own. Oh my goodness those yellow leaves are amazing! I just love the fall colors and flavors! This granola looks awesome too! Oh Colorado's Fall Colors is awesome. You should Google it, my photo pales in comparison to most I've seen. That's why you make your own snacks. That's what I like to do. This looks AMAZING! And your recipe looks pretty easy to follow and this is truly such a quintessential fall treat - I can't wait to try it! Most of my recipes are pretty easy and you can't go wrong with them. aw...this is really a sweet story of your memories and your mom. I also grew up eating Quaker Oats and they have stood the test of time! And of yumminess. And healthiness. And this recipe looks perfect for the fall! Thank you Karen. I still remember it as it was yesterday and even though she's gone now, I still have those memories. What a yummy way to incorporate oats into your diet. I can see this being especially wonderful paired with the pumpkin spice yogurt I recently purchased. That would go perfectly well together! I'm obsessed with pumpkin snacks. And granola can be such a good, healthy way to go. Awesome post! Thank you Shelby and thank you for stopping by. You can usually get coconut sugar at your local Trader Joe's. Well that's where I get mine. Now THIS is definitely something 'pumpkin spice'-themed that I never thought of making nor ever tried. Looks delicious! I'm pretty sure you can 'pumpkin spice' almost anything. I love overnight oats, but I haven't ever tried making granola out of it. Your recipe sounds yummy though!! I need to try it out! Overnight oats is delicious and there are so many ways you can make them. This is going to be my cereal for fall. How delicious is this going to be! Wow! I can't wait to see how the pumpkin tastes. Delish. Oh Terri, it is delicious and perfect for fall. Quaker oats have been my go to oat brand for years and years now. I have been a granola kick lately, enjoying it with some yogurt. Oh that sounds great and yogurt is the perfect pairing food. This sounds so good! Another great reason to always stock up on the Quaker Oats. We never like to run out of them. Oh that's something we never run out of either. My cabinet always has a few packages of Quaker Oats because it's such an easy meal. This looks like an amazing treat! We love granola and I am obsessed with pumpkin spice anything. This is a great fall treat! Most definitely perfect for the fall and I'm a big fan of granola as well. Too easy! This sounds so good. I'm looking forward to making this tonight after I pick up the ingredients. Oh that's great, let me know if you like it if you do actually make it. 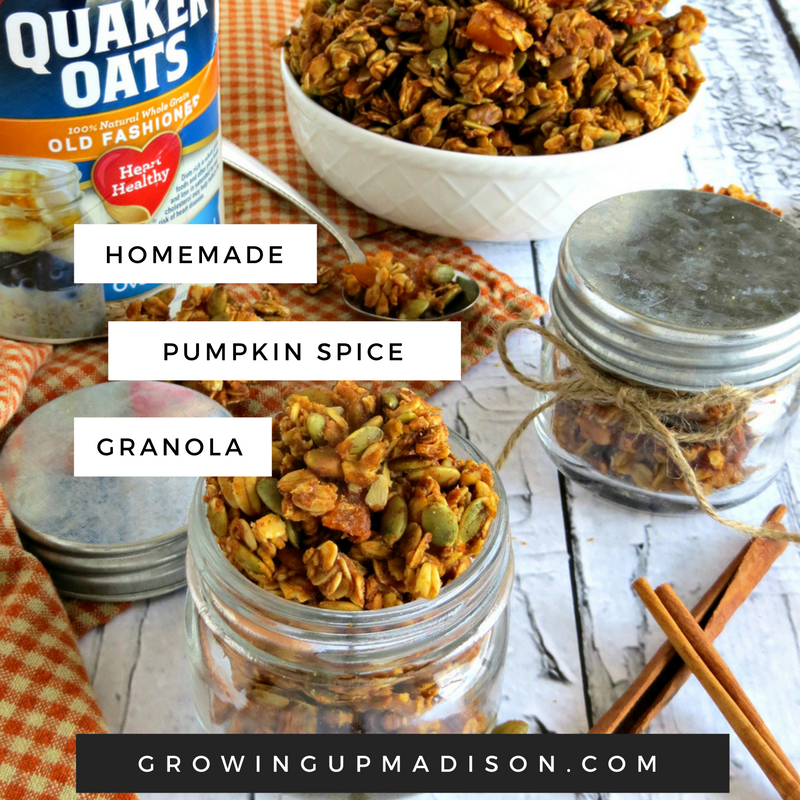 I have a few canisters of Quaker Oats that I need to use up, and this delicious granola recipe sounds like the perfect way to do that. I'll definitely add some dried fruits to the mix for an even healthier punch! Now that's a great idea! Make it all your own. Yum! This looks so good! 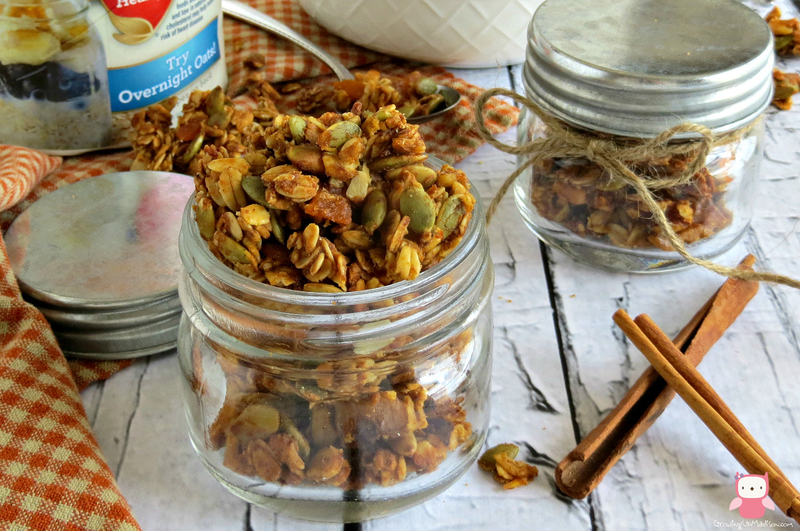 I love love granola and I love pumpkin in anything! Thanks for the recipe! You sound like me. I'm a big fan of pumpkin myself too. Any recipe with pumpkin is right up my alley! I still have Quaker Oats, and would like to make this recipe. It's not only healthy, but it's full all nutritions, and also quick and easy to make. That's why I just love Quaker Oats myself. It's easy to make and certainly good for you. This looks like a super healthy breakfast! I love that you added a fall twist to it! Thank you Toni and it is very healthy and delicious too. Oh my goodness! I've never tried it and I'm pretty sure that I would love it, it taste so good. Bookmarked your homemade pumpkin spice granola. I'll make this today. Well unless you have the recipe, not so sure if you can make it today but that's a good idea. This looks awesome! I definitely want to try this. We love granola. I never thought of adding pumpkin. This recipe looks so yummy! I am definitely trying this one at home. My children eat oatmeal every morning! That's a staple in our house too. While we don't eat it every morning, we do eat it quite a lot. We love to snack on granola. I bet this recipe smells amazing. I will have to get the ingredients I need to make some this week. It smells great and tastes great. You should really give it a try. It's not quite pumpkin, but pumpkin spice, you should totally give it a try. I grew up eating Quaker Oats as well. And now our family loves experimenting with homemade granola recipes. THis ones sounds delish! Oh it is and I've grown up eating Quaker Oats myself too. Nothing better than a great meal in the morning of Quaker. I actually have a big ol' box of Quaker oats in my cabinet right now. It's been a family favorite growing up for me as well. I love pumpkin flavored things, looks yummy! Sounds like most people grew up eating Quaker Oats, I think it's delish and there is so much ways to prepare it as well. This recipe looks sooooo delicious! I love oats, I love pumpkin seeds, I love nuts. I am really looking forward to making this. Yummy! You should let me know if you did eventually make it. That's an absolute delicious oatmeal recipe you put together here. So much good nutrition! Thank you, yes there are so many ways you can prepare oats, you should give it a try. This looks amazing. I love pumpkin. I love oats. And I love making my own granola. Win-win! It sure is a win-win. Give this one a go! Ooooo tis the season of all things pumpkin spice!!!! I never thought of pumpkin spice granola. I'm definitely going to be giving this a try! And you should, this is the season after all. Thank you Angela. We are known for our Fall Colors and I just had to go and get a few pics. They turned out amazing! This looks amazing! I love adding granola in with my greek yogurt. I bet doing it with this would be delicious! My oldesthas even started to love his own granola treats! That is great! My kids love granola bars and it tastes even better when you make your own. I love fall because recipes like this come out to play and it makes me so happy. I love pumpkin season! That looks like it would be yummy mixed into my vanilla greek yogurt I eat in the morning! That's why I love fall myself. All the comfort foods that you can find and make. I love love granola. Especially if it's homemade and without a lot of sugar and oil. It's best to make and eat your own granola, at least you know what's in there. I always wondered what porridge was, and now I know! I remember getting oatmeal in the mornings too. Always Quaker. 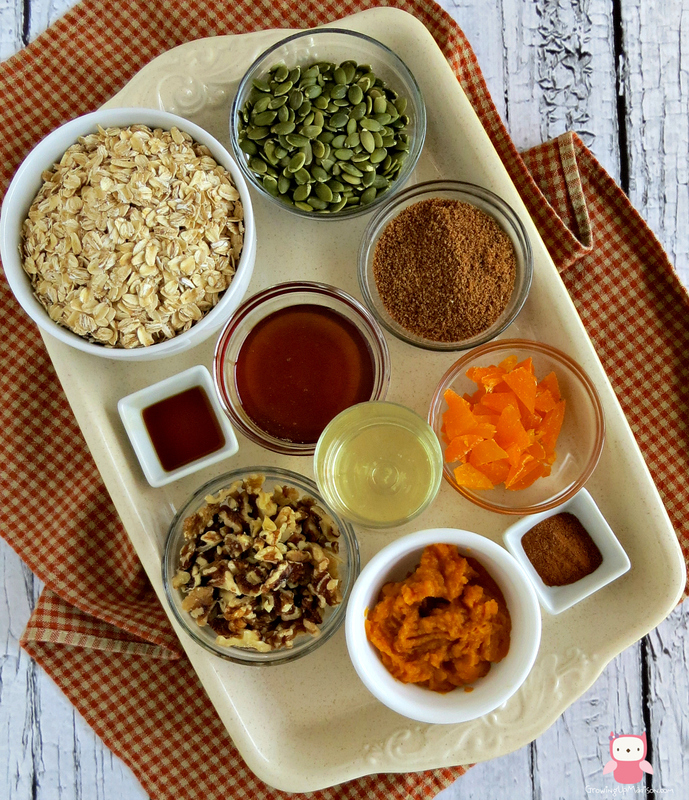 This homemade granola is perfect for Fall! Hahaha, it's what the English call porridge and it's awesome. I don't make it quite as my own mother did but it still tastes great. Granola is one of my favorite snacks. This pumpkin spice version looks absolutely amazing. Oh I love almost anything pumpkin spice and I have to say that this one is one of my favorite. I have never made homemade granola before. This looks so delicious that I definitely have to give it a try. NEVER? Oh you've got to try it. It's amazing and super easy to make as well. 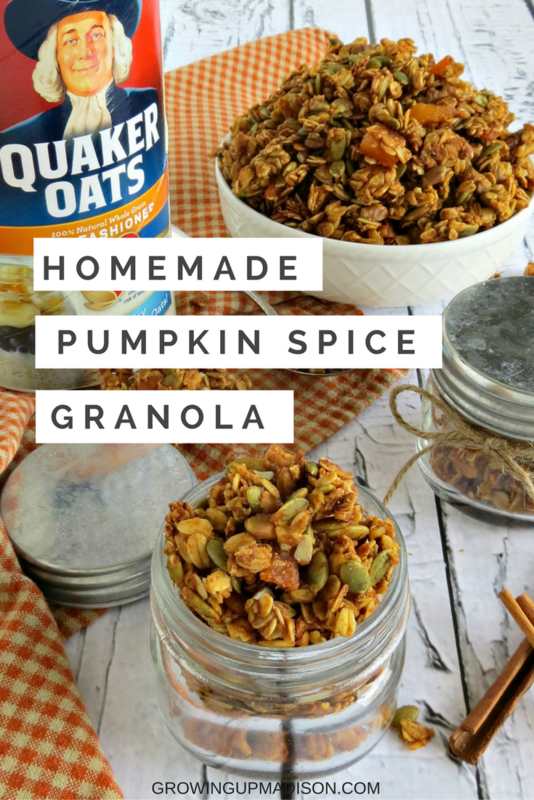 I love granola every now and then, but I never tried it with pumpkin before. I'll definitely have to try this recipe sometime soon, though. Thanks for sharing! You're very welcome Hil'Lesha and maybe you'll give this one a shot one day. When fall comes around, you're sure to find a lot of pumpkin spice recipes, it's pumpkin spice season after all. Thank you Suzanne and I'm a lover of both. Yum!!! Where did you find the dried mango? I'm interested because I've never had that before! I can absolutely see raisins or dried cranberries or something going well in this, too. Can't wait to try it! Have you checked your local Trader Joe's? I tend to buy most of my products there. I've been trying to get "back on track" as well, and it's so much easier when you have flavorful, healthy foods to keep you going. Homemade granola is always so much better. Can't wait to try this one out! You're right about that! I personally prefer any and everything homemade. It does taste a lot better. 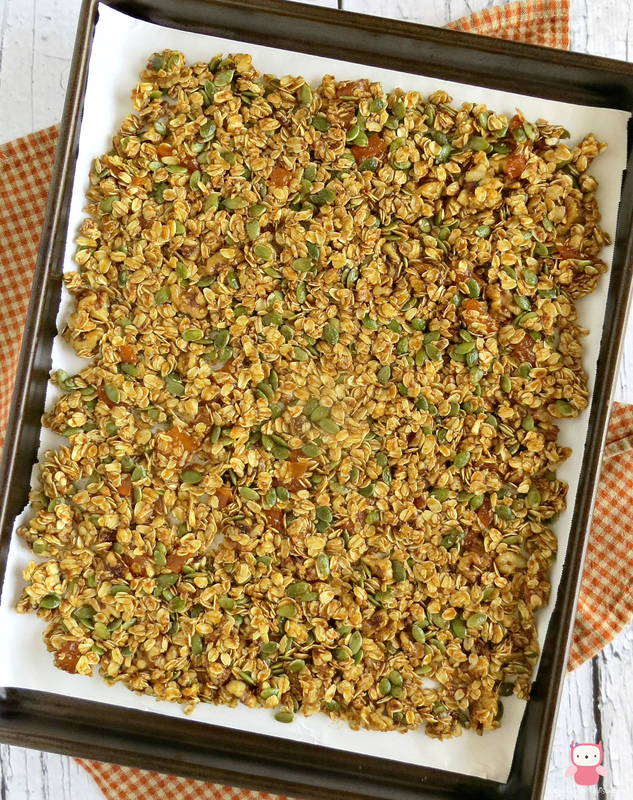 Mmmmm this is such a great healthy snack, it's full of great ingredients I love granola and I'm definitely giving this recipe a try. Thank you Leslie and don't forget you can add/take away and make it uniquely yours. this is actually perfect! I am having the hardest time making everything from scratch! My kids have allergies! I will have to try this! When you have a family of children with allergies, you try and make most things. My daughter I've noticed is now allergic to a few things, so I'm trying to have a lot more healthy alternatives, and homemade is the way I do it. OMG! This looks to die! What an easy, delicious seasonal recipe for those on-the-go mornings! mmm! Don't forget you can take this along with you too, so it makes a great snack as well. This looks yummy. This recipe looks very healthy and Oats can be used for just about everything! This is not only easy but not messy at all. That's what I love about Oats. Super easy to make and just good for you. I do like pumpkin seeds although I have only baked them with spices and lots of garlic. The recipe you have sounds good and it will be nice to try pumpkins seeds in a different way.